Emblems of the great teams of the football league and the Spanish National Team, as well as generic emblems for different sports. Stickers with shapes of people performing different sports, such as football, basketball, golf, etc. Iron-on patches with forms related to horses and equestrian sports, to be placed in training clothes or in the bags and backpacks of fans of these animals and their related sports. Stickers with the main brands of sports motorcycles. Iron-on sticker (patch) with an embroidery of the emblem of the Spanish football team.This is an official emblem, with guarantee stamp and serial number.Content: One iron-on sticker of the emblem and another one smaller with the shape of the champions star.Dimensions: 76 x 66 mm the emblem and 16 mm approx. the star.Material: Textile. Product Description: Sticker (patch) with an embroidery of the emblem of Real Madrid Club de Fútbol. This is the official club's emblem, with a guarantee stamp and a serial number. Content: 1 iron-on sticker. Dimensions: 58 x 80 mm. Material: textile. Product Description: Sticker (patch) with an embroidery of the emblem of Fútbol Club Barcelona. This is the official club's emblem, with a guarantee stamp and a serial number.Content: 1 iron-on sticker.Dimensions: 75 x 70 mm.Material: textile. Product Description: Iron-on sticker (patch) with an embroidery of a shield of a footbol team.Content: 1 iron-on sticker.Dimensions: 38 x 33 mm. Max. length: 40 mm.Material: textile. Embroidered iron-on sticker (patch) with the shape of a soccer ballContent: 1 sticker.Diameter: approx. 45 mm.Material: Textile. 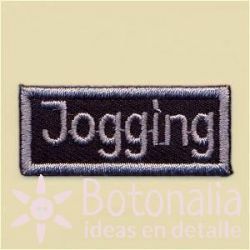 Sticker (patch) in a rectangular shape with embroidery of the text Jogging over a black background.Content: 1 iron-on sticker.Diameter: approx. 42 mm.Material: Textile. Sticker (patch) in an eliptic shape with embroidery of the text SPORT in golden letters over a blue background.Content: 1 iron-on sticker.Diameter: approx. 64 mm.Material: Textile. Product Description: Iron-on sticker (patch) with the shape of a rectangular lable and design related to Gulf Stream Seas.Content: 1 iron-on sticker.Dimensions: 35 x 63 mm. Long. Máxima: 70 mm.Material: textile. 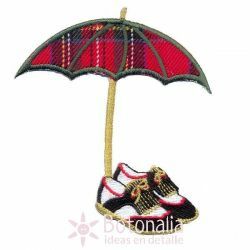 Product Description: Sticker with a design of an unbrella and a golf shoe.Content: 1 iron-on sticker .Maximum Length: 10 cm.Material: Textile. Product Description: Sticker with a design of an emblem of a golf player.Content: 1 iron-on sticker .Maximum Length: 90 mm.Material: Textile. Product Description: Sticker with a design of a woman playing golfContent: 1 iron-on sticker .Maximum Length: 30 mm.Material: Textile. 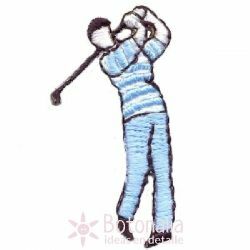 Product Description: Sticker with a design of a man playing golfContent: 1 iron-on sticker .Maximum Length: 36 mm.Material: Textile.